As if the marauding Norscan tribes and the numberless hordes of Chaos Warriors weren’t enough for the free humans, Dwarves, and indeed Undead, and Orcs to contend with, the Beastmen have pitched in too. Cleaved in actually, with honed horn and sharpened axe. Total War: Warhammer’s greatest strength, the element that sets it apart from all other Total War games, is the uniqueness of each of its races. This is achieved through bespoke mechanics, particularly on the campaign map, as well as bold diversities in the races’ unit rosters. Despite being another Chaos horde faction – meaning they worship the Ruinous Powers, and are nomadic, roving killers – the Beastmen are no less unique. 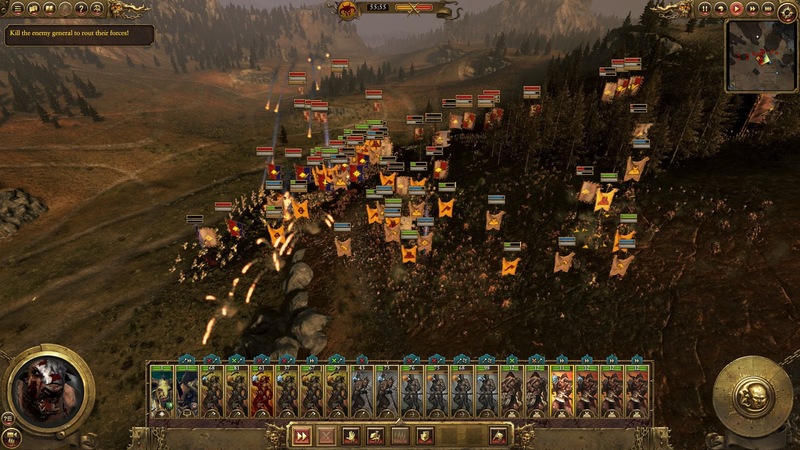 On the campaign map, they combine aspects of the Chaos Warrior’s traits; the spreading of Chaos corruption, and horde dynamics – though they do not suffer attrition from nearby sibling hordes. 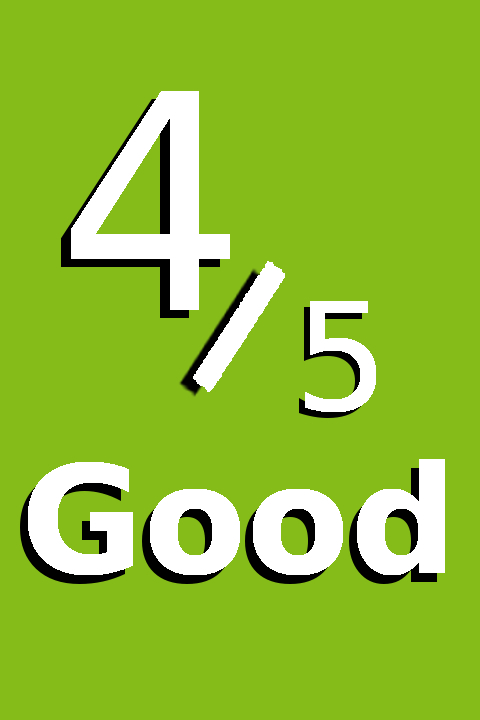 With those of the Orcs; an alternate movement stance, and their own version of the Waaagh meter. 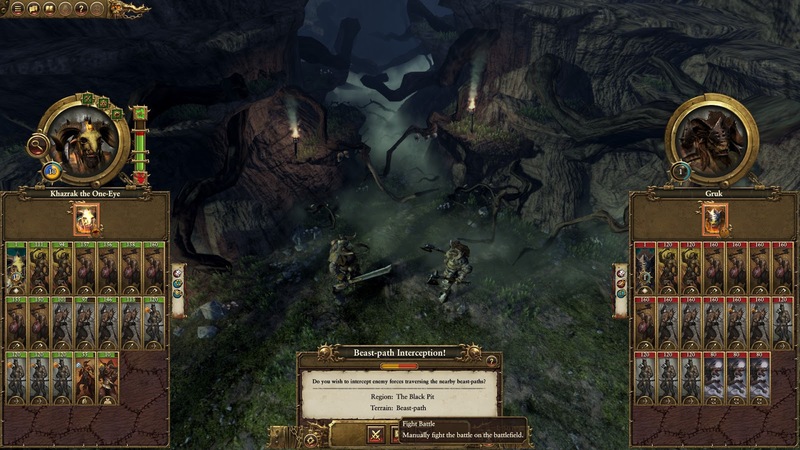 These latter abilities take the form of the Beast-Paths, a means of bypassing elements of terrain in favour of the darkest of forest trails, which risk interception as seen below; with battles taking place on long, visually distinct maps. And the Bestial Rage meter; raised through slaughter and victory, it calls AI-controlled armies to the fight. The Beastmen also have an entirely original mechanic; the lunar cycles of Morrslieb, that force the player to select one of four options, each a faction-wide passive buff with a substantial drawback. The severity of the options depends upon the season of moon. In battle, the Cloven Ones are devilishly fast and brutally aggressive – they have fast become one of my favourite to command, despite their relatively slight unit roster. Gors and Ungors make up the infantry core of the Beastmen, and they have a limited but nonetheless effective ranged capability. Beastigors and the suprisingly swift of hoof Minotaurs are the heavy hitters. While one might argue that the entire race, fast and hoofed as they are, are cavalry, Razorgors and Centigors formally fill that role. Naturally, the Beastmen have their own Lords and Heroes, the magically inclined have access to new strains of magic; the lore of beasts, and the lore of the wilds. 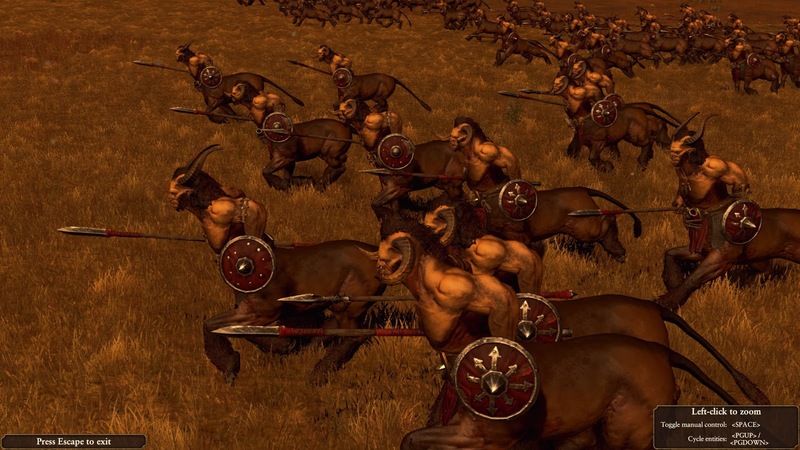 The Beastmen are best introduced through their mini campaign, An Eye For An Eye, if for no other reason than there are fewer enemy factions to contend with. But of course, the Beastmen can be taken into the grand campaign, where their two Legendary Lords offer different starting positions. Sadly, An Eye For An Eye isn’t wrapped around a narrative of any real substance, and so it lacks the more scripted objectives as seen in previous Total War mini campaigns, it’s a straight up killing spree. And that’s fine, but it does make one wonder why a mini campaign is included at all. The Beastmen, for all their singular savagery, are a complex horde. While they undoubtedly have an easier time of it than their Chaos Warrior brethren to the north, particularly in the early game, their braying hordes can be undone by their own success. The Beastmen can either boost their horde’s population growth, or their dark treasury, after a settlement is pillaged – they are razed regardless. Foolishly, I overloaded my hordes with low to mid-tier infantry, who despite costing an arm and a leg in upkeep, could only win battles by sheer weight of numbers, leading to some cripplingly embarrassing defeats by slighter forces. Such a strategy would likely not take a Chaos warlord far in Norsca, and that is perhaps my greatest misgiving with Call of the Beastmen; both campaigns rarely feel challenging for the Beastmen, on normal difficulty of course. That said I enjoyed the bloody rampage in both. An Eye For An Eye feels like a missed opportunity, perhaps criminally so, as it could have been a means of strengthen Total War: Warhammer’s wanting narrative voice. It’s the Beastmen we’re really here for though and they’re every bit as defined as the other playable races, thanks largely to their numerous campaign mechanics. Surprisingly, Call of the Beastmen succeeded in inspiring something within me; casting Warhammer’s Beastmen in a wholly more energised light, added character to miniatures I previously considered dated and lifeless.